We are the manufacturer producing only 100% natural extracts and concentrates from marine products! 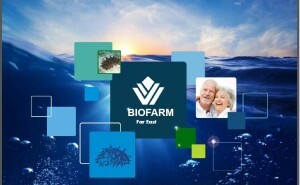 The company “Biоfarm Far East” was established in 2013. We are young but the basis of our products is the long-term work of the Far Eastern scientists concerning using of unique products which the Sea of Japan gave us! Using the developments of the Far Eastern scientists we have already made thousands of Primorye residents healthy and happy! We want to make a person not just healthy but to prolong or to restore his youth, to help him become more energetic, to help always be at the peak of his activity! This means that we help a person in his successful ascent to the OLYMPUS! We all have our own one – and only a healthy body and healthy mind are able to conquer any peaks! Nature has given mankind a unique source of vitality — the sea! And we try to take from this source the most valuable elements your body needs. Now the GMO products spread around the world at the speed of light and only a modern intelligent person can understand that natural foods rich in vitamins, macro and microelements are truly priceless for his body. Not just to extract these macro and microelements with the help of high technology and using only natural ingredients but to save maximum of them in our products. To increase main wealth of human – HEALTH! Be healthy! Take all the most necessary – what we create especially for you!